Meet Twickenham Station before 10.05 to catch the 10.15 to Staines. 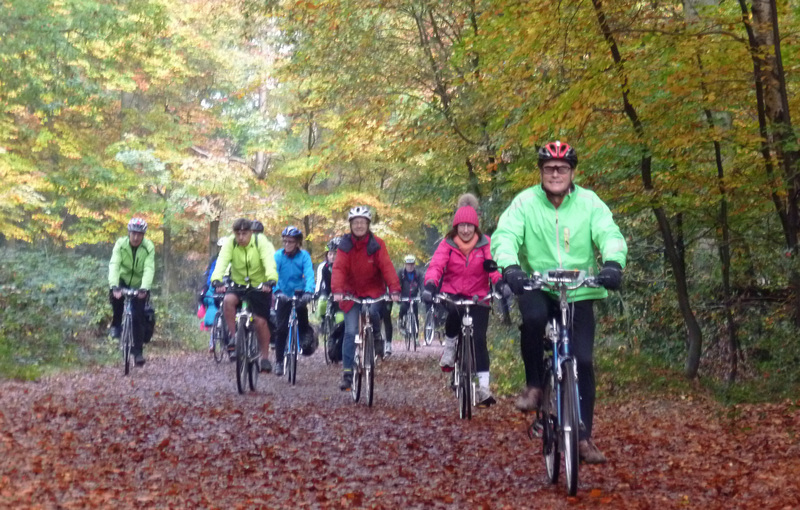 (arr 10.30) We cycle through Staines Moor then via Colnbrook , through Langley Park and past Black Park to quiet Fulmer and finally the woodlands of Burnham Beeches in their autumnal splendour. After lunch in a woodland cafe we head down to the Jubilee River path which takes us to Datchet and so back to Staines. About 30 miles mostly tarmac with some smooth gravel paths. Quite scenic / hilly. Only 4 of us were at Twickenham but another 14 joined at Staines. The day was foggy but the sun peeked through at lunchtime. After a misty ride along the Jubilee River It was quite a shock to hit the traffic back in Staines. The route was commended by all participants. This entry was posted in All Posts, Events, Ride Reports and tagged ride report by Paul Luton. Bookmark the permalink.